So by now you may have seen my Facebook Posts or even my LIVE video with a quick tour of the Just Between Friends Western Gloucester County Consignment Sale going on at Total Turf in Pitman, NJ. First of all, I have been a consignment sale shopper since 2012 – right before my son was born. He will be 6 in April. I have bought baby equipment, clothing, toys, books, puzzles, and so much more from consignment sales. I have been to sales all over New Jersey and I have to say this one is the best. The space is HUGE which makes shopping so much more pleasant. The aisles are nice and wide, making it easy to carry my big blue shopping bag (which you are given as you enter the sale to keep your hands free) without bumping into other shoppers. All the non-clothing items are spaced out around the perimeter by category. There you will find baby equipment, toys, games, books, puzzles, room décor, ride-ons, baby toys, and so much more! And let me tell you, the standards at this sale are amazing. Everything on the floor was neat, clean, and organized. The clothing is clean and I didn’t see anything stained, ripped or pilled. As a homeschool mom, I was super excited to snag these great learning resources. Seriously. I paid $8 for this STEM Magnet Set that currently retails for $49.99. It is BRAND NEW! 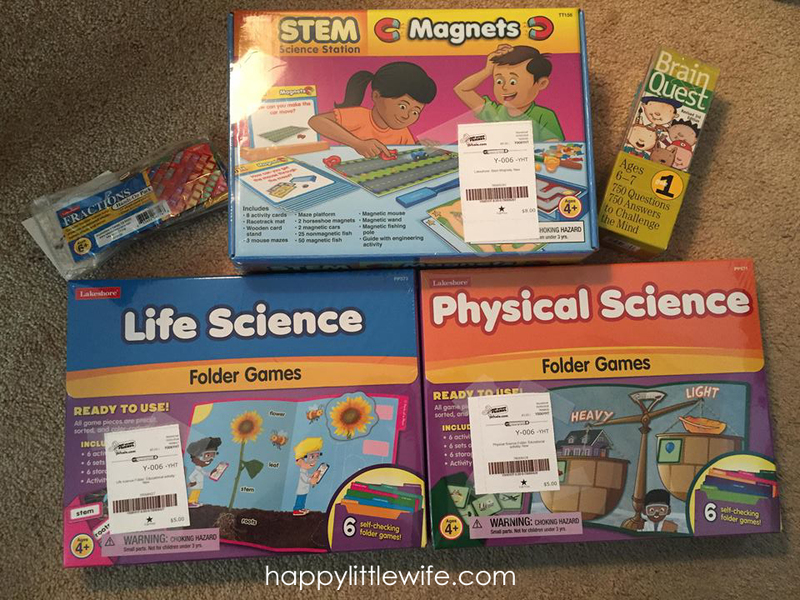 The Life Science and Physical Science Folder Games were $5.00 each — a SAVINGS of $30! The Brain Quest Questions were $3 and the new Fractions Tile Pack was $1.50. Did I mention that everything in this photo is brand spankin’ new?! All this would have cost me $114.91 and I paid $22.50. I don’t know about you, but I don’t have a money tree in my back yard and I get so excited over deals like this! Of course I picked up some clothing for the kiddos too. Here are a few of the things I purchased. 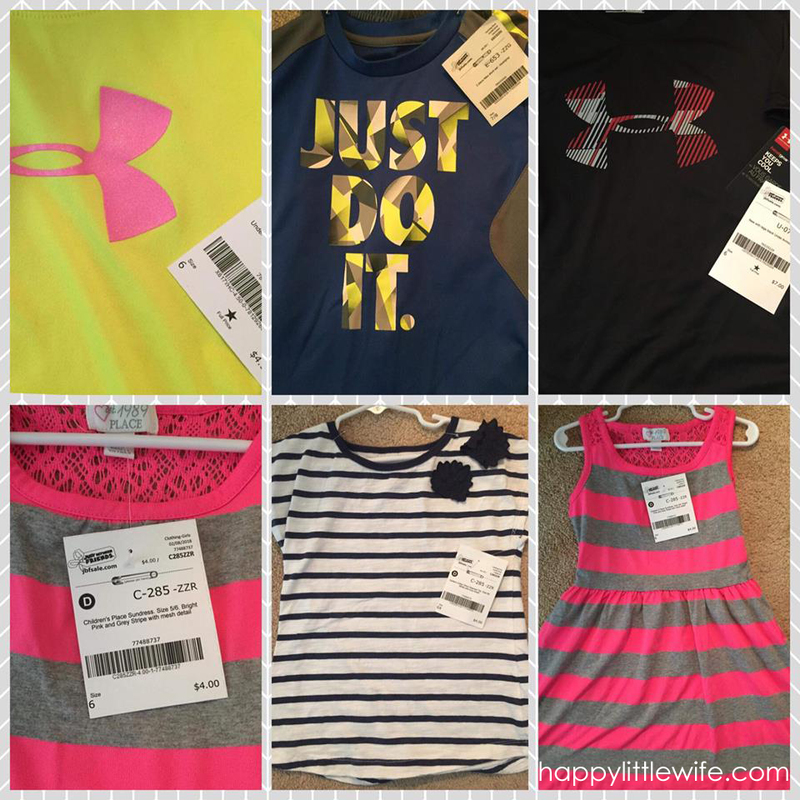 Under Armour shirts – one for $4.50 and one new with tags for $7.00. A Nike Short Set for $8. A Children’s Place sundress for $4.00. I kept looking for the tag on that one – it must have never been worn! And a Carter’s shirt for $4.00. Everything looks brand new! Did you know that a lot of items at the sale will be marked down to 50% off on Sunday? Also, items marked with a “D” will be donated to a local charity if they do not sell this weekend. The charity that the items will go to is The Unforgotten Haven in Blackwood. It’s nice to know that unsold items marked to donate will go to a terrific non-profit organization right within our community. I have personally never consigned at any sales, but I am definitely going to consign at the next Just Between Friends Western Gloucester County Sale. I will let you check out the Consignor details for yourself, but for me it’s a no-brainer. It’s local, it’s a super organized event, and I’ll make some money for cleaning out the kids’ closets! The owners, Jennifer and Michele, are both super sweet and were right there this morning getting everything set up and ready to go! I’m looking forward to consigning at the next sale and will be sure to keep everyone updated when consignor registration opens, so be sure to LIKE, FOLLOW, and SHARE so you don’t miss it! Enter your email address to receive notifications of new posts by email. Don't worry - I don't like spam either! Keep up with me on Facebook!